What the Hell is the Presidency For? The public is invited to a free reception, film and panel discussion about the Civil Rights legacy of President Lyndon B. Johnson and Dr. Martin Luther King, Jr. at the LBJ Museum of San Marcos at 6 p.m. on Thursday, April 5. The event will include a reception and excerpts from the film, “What the Hell is the Presidency For? 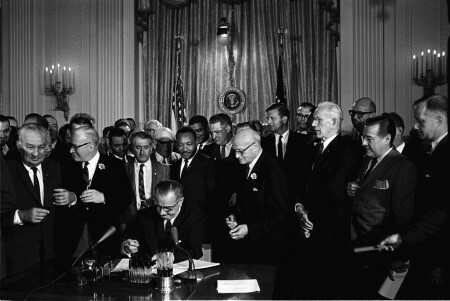 LBJ’s Battle for Civil Rights.” The museum is located at 131 N. Guadalupe St. on the square in San Marcos. The event is co-sponsored by the Political Science Department at Texas State University. A special panel moderated by Dr. Ed Mihalkanin, museum board president and Associate Professor of Political Science, will follow the showing, with panelists Dr. Elvin Holt, Professor of English, and Dr. Rofolfo Hernandez, Senior Lecturer of Political Science at Texas State University. The film, produced by the LBJ Presidential Library, offers a fascinating look at the collaboration between Dr. Martin Luther King, Jr. and President Johnson in forging landmark Civil Rights legislation during Johnson’s presidency. Dr. King was assassinated 50 years ago on April 4, 1968 in Memphis, TN at the age of 39. “We encourage our community members and students at Texas State to join us in a discussion just as significant and important today as it was 50 years ago,” Dr. Mihalkanin said. Dr. Elvin Holt serves as Professor of English at Texas State University where he teaches courses in composition, American literature, African American literature, African literature, and diversity studies. Dr. Holt received a bachelor’s degree in English from Prairie View A & M University, master’s degree in English from Southwest Texas State University (now Texas State University), and a Ph.D. in English from the University of Kentucky. He has delivered scholarly papers before organizations such as the American Folklore Society, Faulkner and Hurston Conference, South Central Modern Language Association, Conference of College Teachers of English, and the Children’s Literature Association. His articles and reviews have been published in journals such as The Zora Neale Hurston Forum, Texas Review of Books, and Southwestern American Literature. Professor Holt is co-editor with Dr. Sandra M. Mayo of Acting Up and Getting Down: Plays by African American Texans, University of Texas Press, 2014 and co-author with Dr. Mayo of Stages of Struggle and Celebration: A Production History of Black Theatre in Texas, University of Texas Press, 2016. His hobby is collecting antique pressing irons. Dr. Holt is president of the Calaboose African American History Museum in San Marcos, which houses a unique collection of artifacts commemorating the lives and contributions of African Americans in early Texas. Dr. Rodolfo Hernandez is a senior lecturer in the Department of Political Science at Texas State University where he teaches courses in Religion and American Public Life, The American Founding, Contemporary Political Thought, Modern Political Thought, Principles of American Government, Basic Political Ideas and Ancient and Medieval Political Thought (Greeks to 1600). He previously taught as a Visiting Instructor at Louisiana Tech University. Dr. Hernandez has prior government experience working at an Americorps demonstration project, the US Treasury Department, and served eight years in the US Army Reserve. Dr. Hernandez received his B.A. in Liberal Arts from St. John’s College (Annapolis) and his M.A. and PhD in Political Science from Louisiana State University. During his graduate studies he was awarded a Huel D. Perkins Diversity Fellowship and a Richard M. Weaver Fellowship His research interests include Ancient Political Theory and American Political Thought. Dr. Ed Mihalkanin is an Associate Professor in the Department of Political Science, with specialties in International Relations, Latin America – Government and Politics, US Diplomacy. Dr. Mihalkanin earned his B.A. in Political Science from Bradley University and his M.A. in International Affairs and Ph.D. in International Relations from The American University. He has been with Texas State since 1990 and has taught a variety of junior level and graduate courses. Dr. Mihalkanin has put considerable effort into many University programs, organizations and committees. He has also served as the Graduate Advisor for the M.A. in Political Science from 1999-2004. Dr. Mihalkanin served on the San Marcos City Council from 1996-2000, 2001-2006 and was elected again in 2016. He also served San Marcos as Chair of the Mayor’s Blue Ribbon Committee on Tourism Development. A founder of the LBJ Museum of San Marcos, Dr. Mihalkanin has served as board president since 1997.